We have only one goal: the complete satisfaction of all our clients. Small business or large concern, locally or internationally active, with just one working language or with many - our client base is as varied as the individual projects we support. Ringier was looking for an intranet solution with its own ‘look and feel‘ and with the ability to use the collaboration features of Confluence. 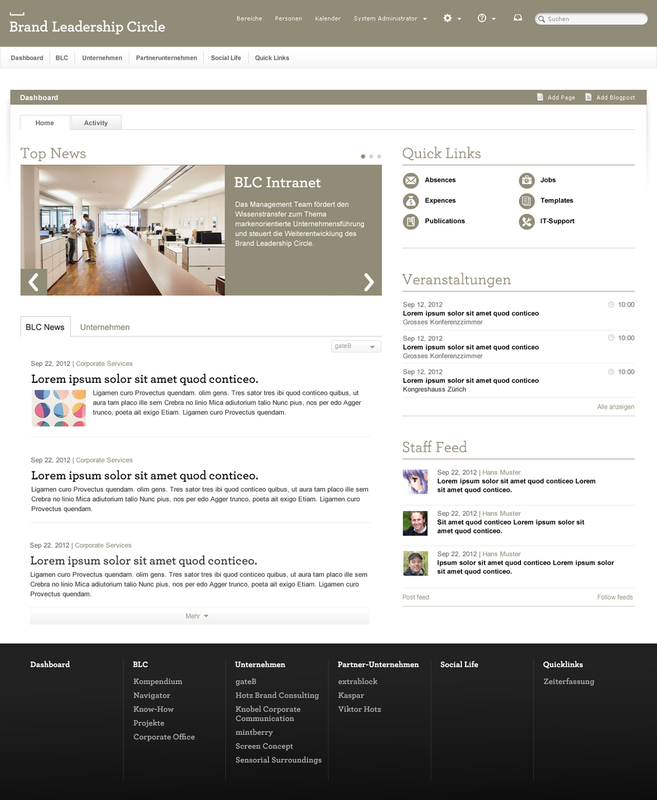 We proposed an intranet based on Atlassian‘s Confluence and the bitvoodoo Enterprise Theme. With the 'single sign-on‘ (SSO) implementation, staff are able to use the solution without having to enter a password. The Brand Leadership Circle collaborative platform brings all the companies in a given corporate group into the same virtual room. Certain areas can be accessed by all participants (in order to promote an exchange of information on a collaborative project, for example) or restricted to specific groups of employees. The intranet solution proposed for V-Zug AG with around 2 000 employees is based on Confluence; content placement is therefore very simple. V-Zug particularly wanted a system that could supply information and scientific documentation, intended to support staff in the workplace. Ease of use was therefore a very important factor. Globus was looking for a way to record requirements and simplify collaborative work with suppliers. A collaboration platform based on JIRA was created to ensure efficient management of information flow. Infogate AG uses JIRA to record the time spent by staff on customer projects and support. Employee time data was previously stored by employees in both JIRA Tickets and in MS Excel (for special report compilation. Infogate is now able to create specific Excel reports in JIRA at the touch of a button. An add-on allows time data to be aggregated in such a way as to allow staff to call up real-time overviews of project status and task credits in any ticket. bitvoodoo ag provided Bank Vontobel with support whilst developing a JIRA platform orientated towards change and incident management, among other functions. JIRA Service Desk provides bank employees with the optimum user interface for system operation. Previously, NZZ used two different helpdesk solutions which lead to confusion and dissatisfaction during all stages of handling tickets, from their opening to their resolution. With the help of JIRA Service Desk, both helpdesk ticketing systems were merged into one application. JIRA Service Desk made a difference to the professional workflow management, the integration of a knowledge base of self-help articles, strong search and filter functionality for finding tickets and their contents, and more streamlined usability. Would you like to learn more about individual projects or products? Contact us!